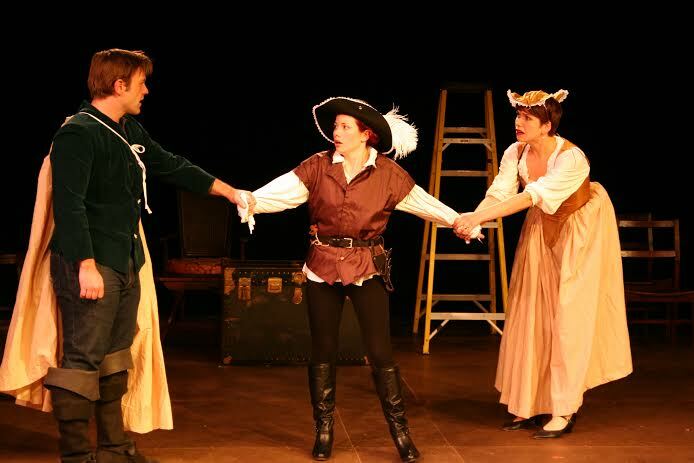 Savage Rose Classical Theatre Company has established its identity in part by adherence to a staging of classic texts in their appropriate period. No Julius Caesar set in fascist Italy, no Midsummer hippies, no hip-hop Romeo & Juliet. So this Twelfth Night represents a small shift for the company. It doesn’t set the action outside the Elizabethan period exactly, but it does employ a loose design concept that is just vague enough about period to allow for interpretation. The stripped down, nearly minimalist nature of the production forces attention on the story and characters and spotlights the high level of quality contained in the performances. The lack of opulent trappings and any sense of pageantry also pare the plot down to its essence, reminding us that Shakespeare was first and foremost an outstanding storyteller. The tale of Viola and Sebastian, twins separated in a shipwreck during a violent storm, is vintage Bard of Avon. Viola wastes no time disguising herself as a man and stepping into service to Count Orsino, and mistaken identity plays a significant part in the developing plot line. Gender confusion in matters of love are a staple for this playwright, and Viola is soon part of a triangle as she falls in love with Orsino while causing his declared love, Olivia to fall in love with her while she woos on Orsino’s behalf. There is also a complex subplot featuring a group of comic figures that are among Shakespeare’s more subtle clowns: Sir Andrew Aguecheek, Sir Toby Belch, Feste, Fabian and the pitiable target of their shenanigans, the stiff-backed puritan Malvolio. Malvolio is one of the most indelible characters in Shakespeare, and his victimization offers opportunity for deeper exploration than this production takes upon itself, but his comedy potential is fully realized in Brian Hind’s nuanced performance, which is thoughtful and understated without missing the chance for broader laughs. His persecutors are essayed by an equally adroit Neil Robertson as Aguecheek, director Charlie Sexton as Toby Belch, and a cheeky Tom Schulz as Fabian. As an actor, it has been a long stretch away from the stage for Mr. Sexton, which might explain a bit of self-consciousness in his early scenes opening night. It did not take long, however, for him to relax more into the role and he quickly hit his comic stride, giving the character his full devotion. As Feste, Tad Chitwood displayed a range of expert foolishness, most memorably a Truman Capote-like voice for his subterfuge posing as a priest visiting the put-upon Malvolio. The three women in the play fare even better, in work that was highlighted by fire and energy. Jennifer Pennington brought more life into Maria, a member of Olivia’s household that is a key part of the conspiracy against Malvalio, than I had previously seen. Such a character could easily slip into bland workmanlike functionality, but Ms. Pennington’s investment in Maria reminds us of the old joke about Romeo & Juliet being a play about a Nurse. Hallie Dizdarevic also delivered a wonderfully complex and mercurial Olivia. These two did more with their eyes than some actors manage with their whole body. Although Viola is often considered the female lead of the piece, they here give her a run for her money. Not that she is given short shrift in Julane Haven’s lively performance, she just has to find her place in a strong ensemble and reconcile herself to the truth that hers is not the only story. That the names Olivia and Viola are nearly an anagram suggests a mirrored pair, and the two characters are rightly given equal weight in this production, restoring order where too many productions favor Viola as a star turn. The character has been venerated somewhat over time, but this Twelfth Night makes a case that she functions better as part of a more complex narrative. Jon Patrick O’Brien brought real authority to Orsino, using his rich and measured voice and masculine bearing to remind us that he is the power in this society, even if he does wear it lightly. Mike Slaton was a good match as Viola’s twin, Sebastian, a point made in a sly bit of blocking in the final scene, but brought mischief and integrity to another often underdeveloped character. Ben Park was a fine, confused Antonio, and Sabrina Spalding, Monte Priddy and Chloe Bell rounded out the cast in good form. Lauren Maxwell was also a part of the ensemble, singing onstage with a lovely voice, but contributes perhaps more significantly as Music Director. The minimalism forces less flash, style and detail than usual from Costume Designer Shana Lincoln, but her still-substantive work cannot be faulted for its service to the director’s vision. The same might be said of Ashley Beck Heimbrock’s lighting, except the unexpected force of the storm scene that opens the play is especially noteworthy given the limited visual aesthetic being employed. Kudos to the inventive blocking there as well. In the end, this is a Twelfth Night that forced me to reexamine my preconceptions of the play, always worthwhile and necessary if we are to be given reason enough to continually revisit 400 year old works. We go back in time theatrically because the material continues to offer rewards appropriate to whatever time we find ourselves in, yet it is it ever enough just to hear Shakespeare’s refined language presented as pleasant poetry? Savage Rose and director Charlie Sexton answer that question with no uncertainty in this intelligent production.